Has WWE Failed Kevin Owens? Three years ago, the WWE Universe was introduced to Kevin Owens; an athlete who at the time was taking the company's developmental system (NXT) by storm. Responding to John Cena's open challenge for the United States Championship on the May 18th episode of RAW, the then NXT Champion wasted little time making the most of his main roster debut. Refusing to battle for the title, the Prizefighter instead left Cena down and out on the mat, hoisting his own belt to signify that he was the superior champion. A huge win over Cena at the 2015 Elimination Chamber event soon followed, giving Owens the momentum he needed to make a name for himself on WWE programming. Although Kevin Owens would drop the NXT Championship to Finn Balor later that year, the Prizefighter would continue to make an impact on the main roster. Defeating Ryback to win his first Intercontinental Championship at Night of Champions, Owens helped generate interest in the mid-card title at a time where secondary championships were just that; secondary. When the time came for the Prizefighter to advance to the next phase of his career, he managed to do so not only due to his talent, but also the amazing chemistry he had with one Chris Jericho. Together, these two men (displayed on television as the best of friends) became a highlight of the RAW roster and routinely participated in entertaining segments and matches. This enhanced spotlight helped Owens gain the Universal Championship; a belt that he held until the 2017 Fastlane event. On said night, Owens was completely dominated by Bill Goldberg, beginning the Prizefighter's downward spiral in the company. Despite winning the United States Championship from his newfound rival Chris Jericho, Owens' star power was on the decline throughout 2017. Joining forces with Sami Zayn aided in that respect (as did a feud with Shane McMahon and Daniel Bryan), but by 2018 the cracks were starting to show once more. WWE creative simply wasn't putting consistent effort into maintaining the aura Owens had, and in the long-term, this has come to hurt the Prizefighter. Following Zayn's untimely injury (which will keep him out of action throughout the remainder of this year), Owens entered a feud with RAW's top powerhouse; Braun Strowman. While the rivalry showed promise early on, it quickly became clear that the Monster Among Men was the more favored talent. By SummerSlam, Owens was a mere stepping stone for his opponent, losing to Strowman in a quick one-sided beatdown. Things would become even more drastic for Owens, as an intriguing storyline with him "quitting" the RAW roster due to his frustration was tossed aside after just one episode. Moving forward, WWE must place more faith in Kevin Owens and his character. Having talents go through bouts of frustration is fine, so long as their character develops or becomes stronger for it. Having Owens lose so emphatically to Strowman should've led to a more aggressive Prizefighter, however, what we as fans have witnessed is Owens aiding the rival who humiliated him these past two weeks. Irregularities like this need to be fixed sooner rather than later, otherwise the only prize Kevin Owens may be battling for is his job. 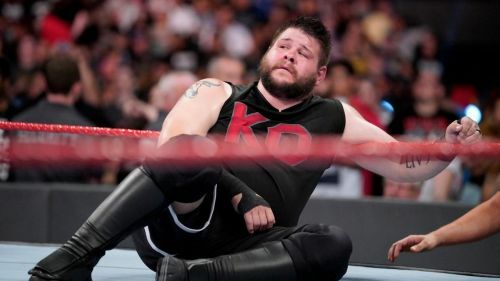 How do you feel about the recent treatment of Kevin Owens? What could be done to salvage his character and help him regain momentum? Let us know in the comments below.